The All American Air Charitable Foundation (AAACF) is a 501c3 organization whose purpose is to provide direction and beneficiary selection of charitable giving and to organize/operate fundraising activities intended to sustain and grow philanthropic support of selected agencies and causes. The Foundation shall be operated for charitable purposes as provided in the Articles and within the meaning of Section(c)(3) of the Internal Revenue Code of 1986, as amended (the “Code”). The purpose of the Foundation shall be focused upon, and shall include, but shall not be limited to, raising funds, and distribution of funds (including cash) to distributees that meet the requirements set forth, and the funding of efforts, undertakings, events and activities. Every distributee of the Foundation must be selected by the Board in its discretion, and be a tax-exempt organization under Section 501(c)(3) of the Code of a federal, state, or local government. The foundation shall be operated not only at the highest level of integrity, but also at a high level of transparency, openness, inclusiveness and accountability. The All American Air Charitable Foundation (AAACF) accepts the simple philosophy embodied in giving, not getting, as truth. 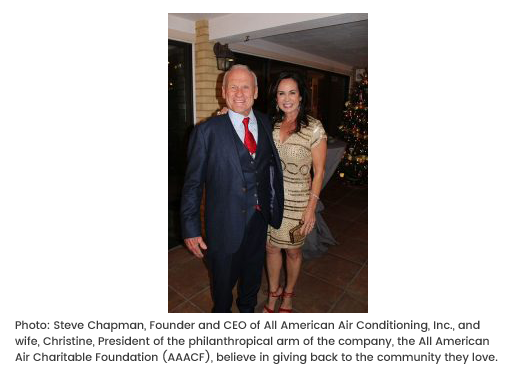 The Foundation was begun first as a philanthropic outreach of All American Air Conditioning, Heating and Appliances, Inc., but has grown into a charitable organization in its own right. Our organization actually began as a fundraiser in 2009 to assist the Junior Service League of St. Augustine through the candidacy of Christine Chapman as Society Queen at the annual JSL Gala. At that time our initial All American Air Table Tennis Classic was born with the intent of a one-time event to raise the needed funds. 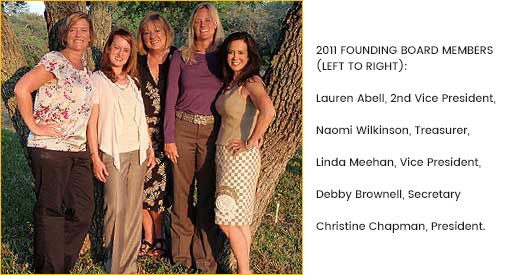 Little did we know at that simple beginning held in the Chapman home that we would be embarking on a 10-year+ journey that would enable us to serve myriads of charities within our community with every dollar donated at our annual event! Steve Chapman’s All American Air Conditioning funds the Classic each year as well as making regular donations to the non-profit that bears its name. Borne out of a desire to serve their community, Steve and Christine Chapman formed the All American Air Charitable Foundation which was incorporated in 2011, and so began the journey that has raised to date $640,000 all to benefit worthy causes in our community.